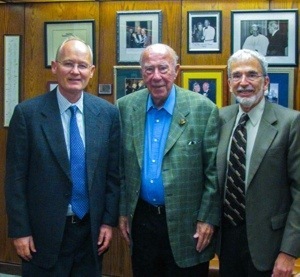 It is my great pleasure to announce that George P. Shultz—an economist who served as Secretary of State, Secretary of the Treasury, Director of the Office of Management and Budget and Secretary of Labor—has joined Citizens’ Climate Lobby’s Advisory Board. Shultz is one of only two individuals ever to hold four different Cabinet positions, serving under Presidents of the United States. He is one of the country’s true elder statesmen, and an advocate for a conservative-minded revenue-neutral carbon tax that returns revenues to the people. Former Sec. of State Shultz is now chair of the Hoover Institution’s Shultz-Stephenson Task Force on Energy Policy. He has joined with other leading conservatives to explain that even those who are skeptical about the long-term risks of climate change should see the wisdom in taking out an insurance policy. Along with Nobel laureate Gary Becker, he co-authored an op-ed that appeared in the Wall Street Journal in 2013 with the title “Why We Support a Revenue-Neutral Carbon Tax“. In addition to serving as Sec. of State during the Reagan administration (1982-89), Shultz was chairman of the President’s Economic Policy Advisory Board (1981–82). As Sec. of State, he played a key role in implementing a foreign policy that led to the peaceful conclusion of the Cold War. He was awarded the Medal of Freedom, the nation’s highest civilian honor, in 1989. He is also a recipient of the Seoul Peace Prize (1992), the West Point Sylvanus Thayer Award (1992), the Eisenhower Medal for Leadership and Service (2001), the Reagan Distinguished American Award (2002), and the Association for Diplomatic Studies and Training’s Ralph Bunche Award for Diplomatic Excellence (2002). He joined CCL’s Advisory Board, because the disciplined, non-partisan organizing of the organization’s thousands of volunteers is having an impact. His agreeing to formally support CCL’s efforts is a sign of both his and CCL’s commitment to take the partisanship and ideology out of the climate debate, and to focus on building a principled, non-partisan coalition of support for effective, responsible solutions.